Halloween shouldn’t be the only time when you are allowed to hang undead limbs and zombie killing weapons in your home. With these zombie decorating ideas and gifts, you will be able to easily prepare your home for any and all undead occasions. 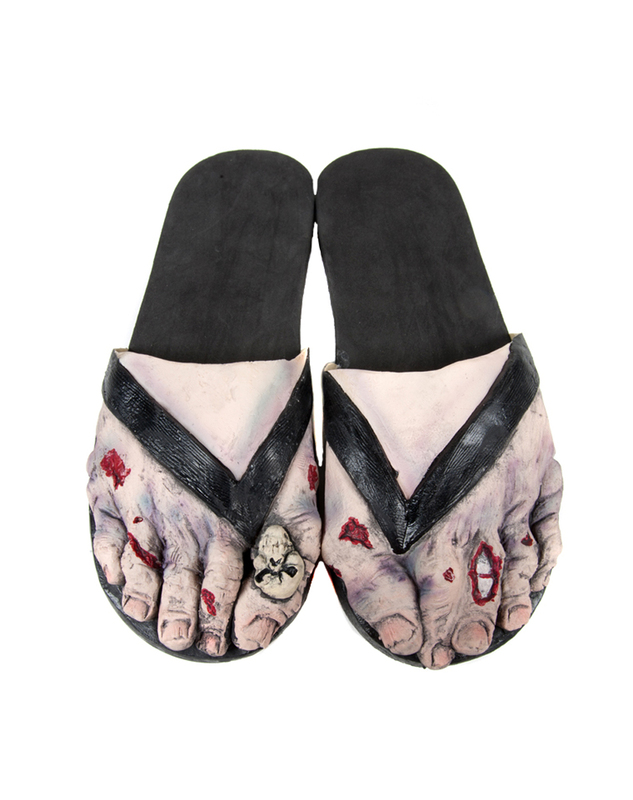 Keep your toes warm with the Zombie Feet With Skull Adult Sandals. Why expose you perfectly manicured toe when you can hide them under a horrible set of zombie feet and fingers. It’s comfortable and will protect your toes, from any surprise. Need a hand? Why not have the whole arm. This severed zombie limb can hang from doors, windows, refrigerator doors and surprise even the king of zombie fans. And why not stop with a zombie arm, why not a severed leg as well. In fact, a bag of zombie limbs is also being sold. When a cut out decoration of Bruce Willis isn’t going to help you out at all, you should have a zombie jointed cut out decoration standing by your front door ready to greet visitors a happy apocalypse as soon as they enter your home. One of the most ingenious zombie decorating ideas is also one of the most gruesome. This zombie Granny will sit on your porch and creep out anyone who comes nearby. Also, this sweet, sweet, sickly sweet granny also comes with her very own zombie baby. Of course, you can’t go about just letting your home victimize your neighbors and your visitors. You should really give them time to prepare or at least a last opportunity to turn back and save themselves. This zombie signs will warn them not to feed the zombies and warn them about the quarantine. Before you get a list of answers to your question, “Where I can get zombie stuff?” you need to understand what makes a zombie store the best there is. You’ll want to be able to check out a lot of choices before you decide on any particular zombie stuff. That’s why for a store to be considered one of the best, it should have lots of zombie items for sale. A whole lot of products won’t matter if you aren’t able to afford it. The best zombie store should have very competitive prices and can easily let you choose the best priced products that are actually included in its catalogue. Great service can be a lot of things, but when you as a customer are pretty satisfied with transacting business with a store, then that’s the mark of great service. Now that you know all about these three characteristics, it’s time to give you the name of one of the best zombie stores around: Bestzombiegifts.com. Order straight from your home and enjoy the benefits listed above and discover why bestzombiegifts.com is considered the best zombie store.